Super fast delivery...2nd product from this company! Good quality so far! Great seller, Very fast shipping ! Just as described, super fast shipping. Pleasure doing business!!!! Having had 2 previous Aquabots which each lasted about 10 years, I decided to replace my 10 year old Aquabot, which was working, but would need repairs (drive belts, brushes) soon, with a newer model. 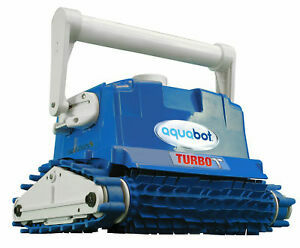 The Turbo T is considerably faster at cleaning the pool and more thorough than the old Aquabot Turbo. The older models would sometimes miss a spot or two, the Turbo T gets everything in 3 hours on my 19X41 foot pool. There are several improvements other than the speed. The removal and insertion of the filter bag is easier. The handle has more positions for changing the cleaning pattern. The wire is not as flexible as the old models. Perhaps I'll get used to it, but I could untangle the old ones faster. The one feature that is not as good is the release for the handle. The old models used a metal ring which was fairly easy to pull and release the handle. Now, it uses a plastic plate with a tab. I find it very difficult to use the small tab to release the handle. A small problem. Overall a considerable improvement over the old models. I'd recommend it to anyone considering an automatic pool cleaner. 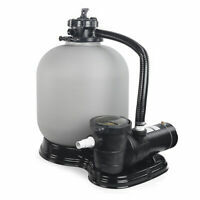 If you've never owned an Aquabot or any other self contained pool cleaner, you should be aware that after cleaning the pool, you must clean the filter bag. 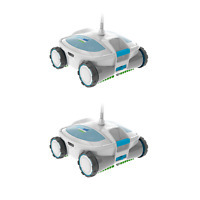 Remove from the robot, turn inside out and spray with a hose. A bit messy. It would be nice to see a "backwash" feature as is on the filter, but that's not available on self contained pool vaccums, so you need to clean the bag. Love: does a great job cleaning the pool - we have an older inground - you can see indentations (foot prints, etc) in the bottom. We purchased this unit because it has the jets and the scrubber- works amazing! Probably the best pool purchase we made! minor con: cord does get twisted, it would be nice if the unit had a swivel so this wouldn't happen Overall - if you want more time on your hands to enjoy your pool, get this unit!